Today's hectic, demanding lifestyle can have such a negative effect on our health and well being. The sheer level of everyday stresses and strains caused by the pressures of modern living is one of the major causes of low energy, lack of vitality and general absence of wellbeing. This carefully blended elixir from Peeled Orange contains Lavender, Cedarwood, Geranium and Petitgrain. Peeled Orange Soothing blend, is a hypnotic, euphoric elixir, which will transport your mind and soul to a garden of tranquil harmony. Use Peeled Orange Soothing blend when you feel overwhelmed and need that little extra help to cope with the pressures which come to us all from time to time. 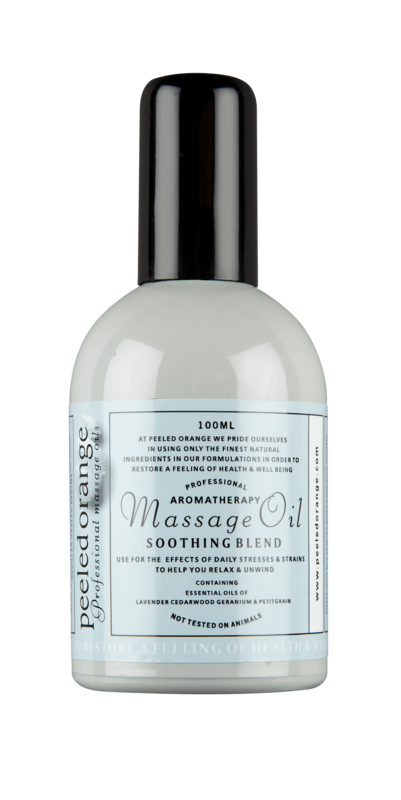 Peeled Orange Soothing blend has a deeply mesmeric effect, so relax and enjoy its evocative, seductive powers. Lavender has long been favored by Aromatherapists across the world for its soothing qualities. It will calm the mind from every day stresses and strains. Its beautiful fragrance and relaxing properties will ease muscular tension and uplift the mind and spirit. Peeled orange use the finest oil from the aromatic wood of the Virginian Cedarwood variety. Cedarwood essential oil is used by Aromatherapists to help with every day stresses & strains. Long favored by the Egyptians, it is said to sooth the emotions, thereby creating an inner peace. Geranium is a very balancing, soothing & tranquil oil. It can create feelings of elation, eliminate worry and remove negativity. Geranium has a heady, enchanting aroma and creates an atmosphere of inner calm and peace. Petitgrain is a deeply enchanting oil, held in great esteem by Aromatherapists through out the ages. This is a highly sensual oil and has been carefully selected for its soothing, mood enhancing properties.